HomeBasketballWhat went wrong in Syracuse’s loss to Boston College? 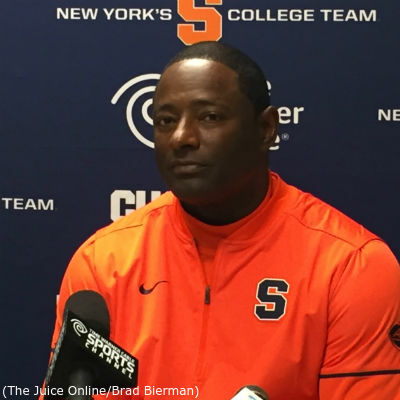 What went wrong in Syracuse’s loss to Boston College? 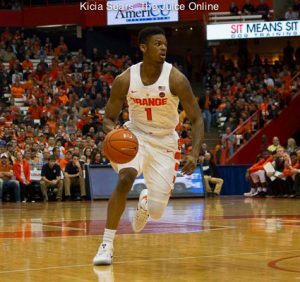 For those Orange fans who thought that the start of league play would bring about a change in fortune from the team’s out-of-conference slate, think again. 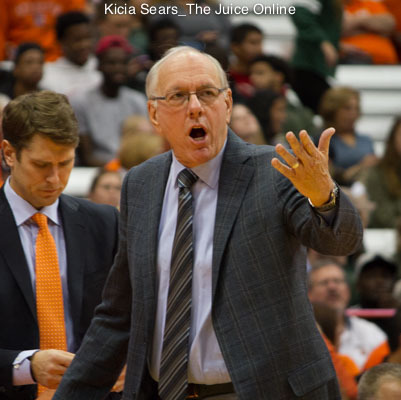 Syracuse opened its ACC schedule with a 96-81 drubbing at Boston College. Yes, Boston College. The same BC team that lost to Nicholls, Hartford and Fairfield. And the same BC team that, while playing on its home floor, had a 50-50 fan allegiance at best, based on observed number of orange t-shirts and crowd noise. So even though Festivus took place on December 23, it’s fair to do one more Airing of Grievances. This game was full of them. For years, the hallmark of the 2-3 zone has been holding opponent’s shooting percentages under 40 percent. In the first half, Boston College shot 52.9 percent overall and 50 percent (6-of-12) from beyond the arc. The Eagles were just getting warmed up. BC torched Syracuse in the second half to the tune of 62.1 percent overall and a blistering 71.4 percent (10-of-14) on triples. For the game, BC shot 57.1 percent and 61.5 percent on threes. On the other hand, Syracuse, remarkably, shot 38.2 percent for the game making an identical 13-of-34 in each half. The Orange converted only 30 percent of its three-point attempts, 6-of-20. One area where Syracuse was significantly better than the Eagles was the free throw line as the Orange made 23-of-30 (76.7 percent) for the game while BC was only 8-of-17, a mere 47.1 percent. The Orange’s advantage from the free throw line was negated by BC’s brilliance from three. The Eagles connected on 16-of-26 attempts. They made as many in the first half (six) as Syracuse did the entire contest. More troubling was that BC made more three-pointers than Syracuse had assists. But we’ll get to that. One area Jim Boeheim kept going back to in his post game press conference was Syracuse’s struggles from the point guard position. Frank Howard and John Gillon combined for 10 points, six assists and four turnovers while shooting 3-of-16 and missing all six three-point attempts. Howard started the game but Gillon started the second half. Boston College’s starting backcourt was, to borrow a Vitale-ism, simply sensational. Sophomore Jerome Robinson entered the game averaging 20.5 PPG and 5.2 RPG; third on the team. He finished with 22 points on an efficient 9-of-12 shooting including three from downtown. His partner in crime was Ky Bowman, a 6’-1” freshman. Bowman was purely awesome. He gashed the Orange for 30 points on 11-of-17 shooting. Included in that was a Steph Curry-esque 7-of-8 on threes. Bowman also handed out nine helpers while hauling down five boards. The Eagles whipped the Orange in the assist department, 28-12. More telling was the assist percentage. BC assisted on 78 percent of its field goals while the Orange assisted on only 46 percent of its buckets. Tyus Battle led the Orange with four dimes. In addition to Bowman’s nine assists, Robinson had four while forwards Connar Tava and A.J. Turner had seven and six, respectively. BC’s aerial assault (and Syracuse’s lack of) has already been discussed in length. Not only did BC bury the Orange from deep but they beat them around the basket too. The Eagles outscored Syracuse in the paint, 38-30, and on the fast break, 12-3. This was not exactly a recipe for starting the New Year off with a bang. And without a drastic improvement defensively and better point guard production, it’s a result bound to repeat itself. A lot.